The hotel complex is situated on the longest sandy beach of Crete, between Chania and Rethymnon. The luxury resorts consists of a main building and several two-floor buildings with many very spacious, tastefully decorated rooms. 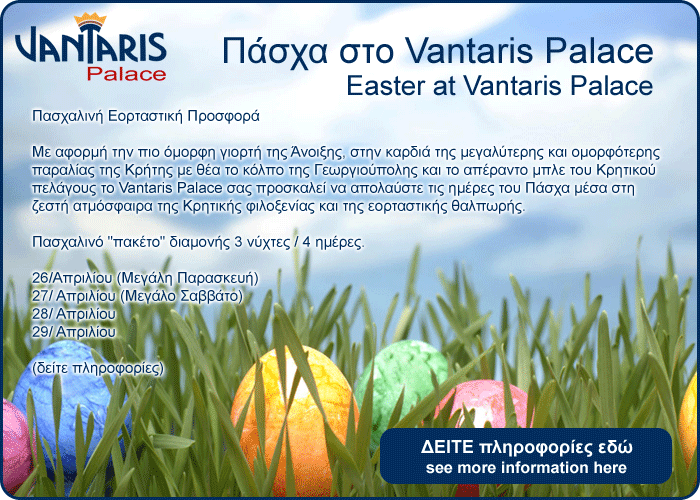 The extravagant Greek cuisine at Vantaris Palace with regular rich varieties of splendid buffets at breakfast and dinner. Indoor Pool, Gym, Whirl Pool, Sauna, Massage, Tennis Court with Floodlight, Table Tennis, Mountain Bikes, Sun Shades and Sun Beds at the Pool and Beach. Vantaris Palace in Kavros, Crete, is a 4 star hotel built on the north and east sides of Chania on the longest beach in Crete. It is suitable for families with children, and promises an unforgettable holiday in Crete. It is a conventional hotel consisting of two-storey building and a central one. Starting on the highway from Chania – Rethymno the luxurious Vantaris Palace ends up at Kavros beach with its crystal clear waters and golden sands, 4 km from Georgioupolis. The location is very popular with nature lovers as it combines mountain, sea, wildlife and landscapes of incomparable beauty such as the Lake Kournas located a few kilometers away which has been included in the Natura 2000 network and is a protected area for birdlife. Vantaris Palace is characterized by its design and arrangement specially formulated to bring out the maximum in all areas of the hotel and the perfect location just above the sea Kavros with wonderful sea views.